This exciting boat is best described as "The point at which perfect design meets perfect execution!" 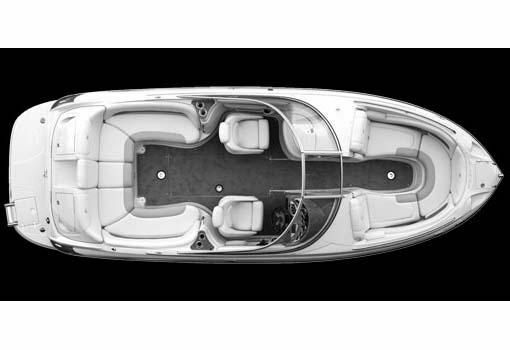 The 240 LS interior features a classy tri-color platinum interior design with bow "hot tub style" lounge seats that conform to your body for maximum comfort. The U-wrap cockpit seating configuration boasts a comfortable 14 degree recline-angle, which is twice the recline-angle degree of most boats in the industry. The "sports Car Styling" of the exterior lines and Crownline's ingenious F.A.S.T. Tab hull design unite to make an eye-catching bowrider that handles and looks like a dream! 550 FRESHWATER hours on her 5.7L 300HP Mercury engine and Bravo 3 Outdrive. You do not want to miss out on this well maintained bow rider that will be endless fun for the whole family. Options include: Snap in carpets, Wakeboard Tower, Integrated Bimini Top, Red Hull, and Tandem Axle Trailer included.